Bruce Wayne spent thousands of dollars on his Batman batsuit, but you can have one for less. 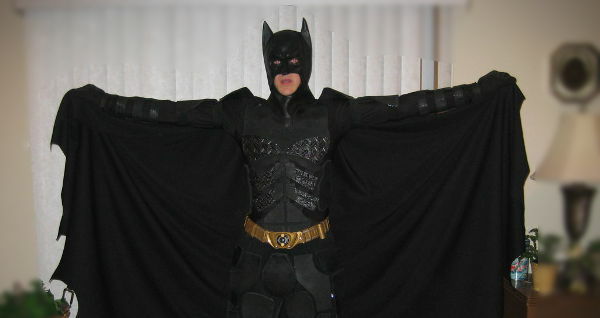 On Instructables.com, nbennie02 shared his designs for a Batman Costume based on The Dark Knight Rises). While it's not the most movie accurate suit you've ever seen, it's definitely one of the cheapest and easiest ways to get the Batman look you're going for. It uses common, easy-to-find parts like foam flooring, craft foam and a tablecloth. The whole thing costs about $50 unless you get fancy. While you may not think it's impressive now, watch a video of him attending the midnight premiere of The Dark Knight Rises in his costume: Youtube "Scranton Batman" With the voice and the attitude, he really sells it. After the Colorado shooting, you'll never get into an AMC theater without taking off your mask. But, maybe you can use it to buy the Blu-Ray disk at "Best Buy." Make sure you YouTube it. As long as you have the suit, why not follow these tips to turn your car into a life-size "Tumbler" Batmobile? What are you waiting for? Gotham City needs you! Would you make a Batsuit? What's the craziest costume you've ever worn? I'm sure my wife would be all for it! Weirdest costume would have to be the year I went as a military zombie. That would be good for my Practical Superheroism segment. Though I doubt it would give you a lot of protection. Yeah Pat, I don't think it would protect you from dog bites. Alex, maybe she could dress up as TDKR catwoman! outside of a paper bag and a marker, i would be lost. The guy's voice is the best part of the video. M pax, what are the odds? Only in NY. I made a bat costume for my kids once, but it was a real bat. Not bat man. They were cute but kind of looked like torn up black rags! I was Batman as a little kid. My parents still have the plastic Batman helmet. I had a blast running around with the helmet that was really way to big and a cape that my feet got tangld up in. Lydia, you can't get much more Batman than that. More like Man-Bat.